1 TRILLION possible combinations! 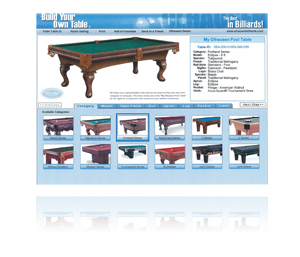 You can visit The Pool Shoppe and work with one of our Sales Representatives at our Kiosk in the showroom, or visit the link below to design your pool table at home. The Build Your Own Table® application allows you to see exactly what you desire including stain and cloth colour. At the end of your design experience at home, you can print your masterpiece and bring the printout to us to see what other options may be available. It’s that easy! What’s the simplest way to let everyone know that your table was built just for you by the Olhausen Family? Olhausen will laser engrave your family name or club’s name on your table at no additional cost! Every Olhausen table is built with an Olhausen logo – whether it be a brass or chrome plate or laser engraved. The Olhausen team can insert your family name into their laser engraved logo providing you with a legacy that can be passed down from generation to generation.